President Donald Trump held up a newly signed executive order aimed at preventing violence against Federal, State, Tribal, and local law enforcement officers. 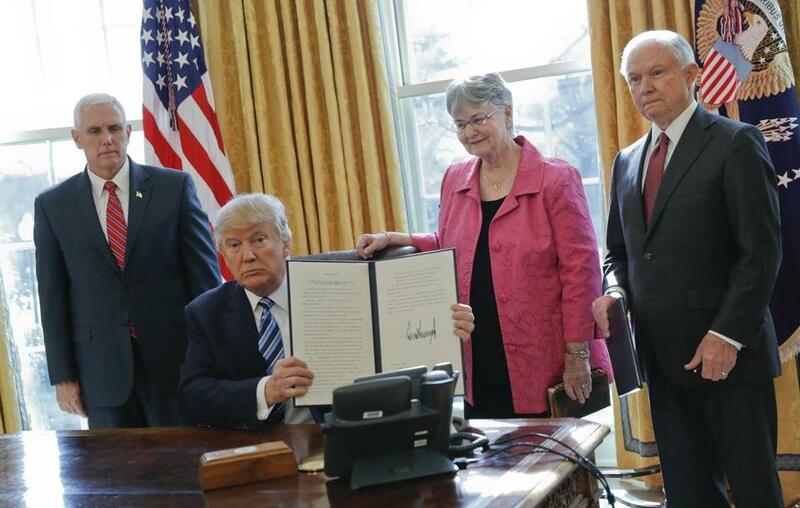 President Donald Trump signed three executive actions Thursday designed to crack down on violence in America, directing the Department of Justice to take ‘‘all necessary action and lawful action to break the back of the criminal cartels’’ and to form task forces focused on reducing violent crime and crime against police. But Trump has, in the past, misstated crime statistics or not presented them in the proper context, presenting a somewhat bleaker view than perhaps is warranted. He has accurately cited a statistic from the Brennan Center for Justice, which found that, in the largest 30 cities, homicides increased by 14 percent from 2015 to 2016. But in that data set, one outlier city - Chicago - was responsible for 43.7 percent of the total increase in homicide rates in 2016. The latest FBI data show a more than 10 percent increase in murder and non-negligent manslaughter from 2014 to 2015. But the murder rate is down even from as recently as 2009, and it has been declining - with a few upward blips - since the height of the crack epidemic in the early 1990s. Nonetheless, Sessions said in his own remarks that America had ‘‘a crime problem,’’ and it was no mere anomaly. Sessions mentioned violent crime in his remarks even before terrorism, indicating just how high a priority it might become in his Justice Department. It is unclear, though, what exactly Trump’s task forces will do. The White House did not immediately provide the full text of the executive actions he signed, and a spokeswoman did not return a message seeking comment. Law enforcement is generally a local matter, though federal authorities work with local police departments and others on task forces throughout the country. Last month, Trump said he might send ‘‘the feds’’ to Chicago to deal with the city’s violence; officials noted that, in a variety of ways, they already had been working there. Trump said one of the task forces will be focused specifically on the problem of violence against police. According to the National Law Enforcement Officers Memorial Fund, there were 135 officers killed in 2016, up from 123 the year before, and 64 were shot and killed, up from 41 the year before. Some cities in recent years, including Ferguson, Missouri, Baltimore and Charlotte, North Carolina, have seen protests and violence erupt after incidents of black men being killed at the hands of law enforcement officers. The Justice Department under former president Barack Obama sent mediators to those cities to try to keep the peace. The Obama administration also aggressively investigated the police with systemic reviews of entire departments to address the root cause of conflict between law enforcement and residents. Neither Trump nor his attorney general mentioned such investigations at the swearing-in ceremony. On the White House website, the Trump administration has hinted at a crackdown on protests. ‘‘Our job is not to make life more comfortable for the rioter, the looter, or the violent disrupter,’’ the site says.